Maintaining Hair Health | Stylistic Inc. According to Hairfinder, the average person loses somewhere between 50 and 150 hairs on a daily basis. 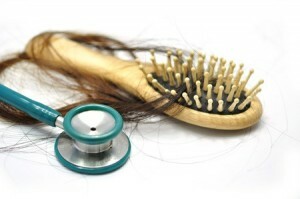 Hair loss and regrowth is a natural, cyclic process that we all go through. Medical and hereditary conditions, as well as certain medications, can lead to excessive and worrisome hair loss. Read on to find out about some of the most common causes of hair loss and what you can do to combat them. Hereditary hair loss is the most common cause of hair loss and is caused by a gene inherited from one or both parents. This type of hair loss occurs very slowly and typically begins at the hairline behind the bangs. If you think your hair loss is genetic, visit your dermatologist and apply minoxidil twice per day to decrease or slow the effects of hereditary hair loss. Another common factor contributing to hair loss is Telogen Effluviam. Caused by stress, drastic weight loss, pregnancy and more, Telogen Effluviam speeds up the hair growth process, making more hair fall out than normal. Unless the hair loss is related to a medication you are taking, it will slow back down to normal with some time or the reduction of stress. If you think your hair loss is related to a medication you are taking, discuss lowering your dosage or switching medications with your doctor. Thyroid disease is found most commonly in women, and occurs when your body does not produce enough thyroid hormones. Common symptoms for hypothyroidism include weight gain, hair loss and depression. Often called thyroid disease, hypothyroidism most commonly effects women and can be found through a series of blood tests. If your hair loss is related to thyroid disease, there are medications you can take to readjust your hormone levels to normal, leading to an end to your hair loss scare! While these are three of the most common reasons for hair loss in women, there are many more possibilities. To learn more about hair loss and how you can slow down or prevent it, visit ABC News. If you suffer from hair loss and are interested in having a full, beautiful head of hair again, contact Stylistics to learn about our hair replacement systems and what option will work best for you!